For more than 70 years, "Jeep" has been the leading name in vehicles that can go just about anywhere. The heavily updated 2019 Jeep Wrangler is still something of a mystery - since Jeep has only shown it off to select groups and is yet to release much in the way of official information. Fortunately, a bit of digging and investigation can reveal some concrete and very impressive bits of information about what's in store for Colorado Springs Jeep lovers in model year 2019. While it is unlikely that much of this will change when the 2019 Wrangler hits showroom floors, it's important to make sure you get specific details about any model or trim level you are particularly interested in. With that in mind, it is clear that Jeep has listened to concerns and criticism over the last year and built the 2019 model to improve on everything that needed it while keeping all the good stuff from the last redesign. The 2019 Jeep Wrangler features LED headlamps and rear lights, for excellent illumination and visibility, and two available engines that offer different levels of power and fuel economy. Trim levels are really impressive this year, with multiple packages that include things like remote ignition and larger display screens on the center control panel. Although Jeeps have fewer airbags than SUVs, there are some available extra safety features on the 2019 model including blind-spot monitoring and rear parking sensors. Just like in any other vehicle, power and performance in the 2019 Jeep Wrangler really comes down to the engine, so does fuel economy, and there are two options available. The standard engine is a 3.6L V6 that offers up to 285-hp and 260 lb.-ft. of torque. This offers a lot of power and should be ideal for most drivers, but for those who are looking for a little extra performance, or plan on tackling some very imposing terrain, then there is another option available on all the 2019 Wrangler models. The more impressive engine is a 2.0L turbocharged 4-cylinder that can provide up to 270-hp and up to 295 lb.-ft. of torque. This comes with an 8-speed automatic transmission and can tackle pretty much anything you might want to throw at it. It's also worth mentioning that this engine gets much better overall fuel economy than the standard 3.6L one. When it comes to fuel economy, the standard engine comes with a 6-speed manual transmission that gives you 17 MPG city and 23 MPG highway, for a combined 19 MPG estimated. That's decent for this class of vehicle, but perhaps you're looking for something better. If you want, there is an option for an 8-speed automatic transmission with this engine that can help improve the fuel economy. The 8-speed transmission provides 18 MPG city and 23 MPG highway, for 20 MPG combined. If fuel economy is really important to you, however, then the 2.0L engine with the 8-speed automatic transmission is the way to go. This setup gives 23 MPG city and 25 MPG highway, for 24 MPG combined on the 2-door configuration. If you have this engine and transmission with a 4-door model, then it becomes 22 MPG city and 24 MPG highway, for 22 MPG combined. Jeep estimates that this setup can save about $200 a year in fuel thanks to the improved fuel economy, even with the use of premium. One of the best things about the overall design of the 2019 Jeep Wrangler is just how much customization and how many options you have when making a decision. First of all, you can choose either a 2-door or 4-door model, depending on just how often you plan on having back seat passengers in your Jeep. Both configurations are offered for the Sport, Sport S, and Rubicon trim options. However, if you really want more comfort and plan on having more passengers, then the 4-door configuration includes the Sahara trim level, which certainly places a priority on luxury and comfort. Just looking at it, the 2019 Jeep Wrangler has an impressive style and design - with a front grille and bold lights that immediately make an impression. The overall body shape is clearly meant for off-road driving but doesn't sacrifice style or sophistication to make this possible. The soft-top roof is easier to put up or down than in the past and has more available configurations. This lets you easily open up the sides for better airflow throughout your Jeep while leaving the top up to protect you from the sun. Certain trim levels include features that others don't, as you would expect, and stepping up to the Rubicon or Sahara levels really opens the door for some incredible features and options. This includes 18-inch wheels and all-terrain tires on the Sahara, while heavy-duty winch-capable bumpers are available on the Rubicon. A premium soft-top is available on all the 4-door models, and the 2-door Rubicon trim level, and every model can be fitted with a 3-piece modular hardtop instead. This is perhaps the single best area of improvement in the 2019 Jeep Wrangler over years past. It is clear Jeep recognizes that people want access to all the bells and whistles of a luxury vehicle while off-roading and enjoying the outdoors. Certain features are only available at specific trim levels, however, so anyone interested in technology options should pay particular attention to what's available and choose appropriately. The Wrangler Sport and Sport S trim levels are excellent, though the Sport S certainly has more options, while the Rubicon and Sahara levels offer the most options and available features. All 2019 Jeep Wrangler models include a 5-inch touchscreen display on the middle console, a USB port, and an 8-speaker audio system. 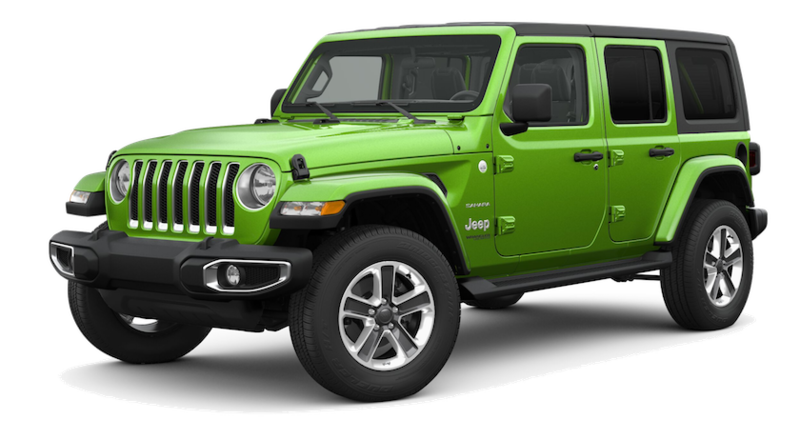 Air conditioning is optional on all models but is included baseline on others, such as the 4-door Wrangler Sport. More impressive trim levels, like the Sport S, include options for remote ignition and a universal garage-door opener. Additional available features include dual-zone climate control, a 115V power outlet, a second USB port, and automatic headlights. A 7-inch Uconnect touchscreen display is also available for the Sport S. Uconnect provides a range of additional features, such as connectivity with an app on your smartphone, and includes support for both Apple CarPlay and Android Auto. The Rubicon and Sahara trim levels offer the very best in technological packages for the Wrangler. This includes an available auto-dimming mirror, a 9-speaker sound system, and an 8.4-inch Uconnect touchscreen as part of an overall information and navigation system. Additional LED lighting can be added, including fog lights, parking lights, and daytime running lights. Jeep continues to test, develop, and innovate in making their vehicles as safe as possible, even in the rough and unpredictable conditions in which many people drive them. Every model, regardless of trim level, comes with front and side-impact airbags to help protect the driver and any passengers in the case of an impact or other accident. There are no curtain airbags available in Jeeps due to their design as convertible vehicles. This is not a surprise, but certainly something to consider for anyone with a family or who plans on having children as passengers. Fortunately, the designers have really stepped up their game in terms of the kinds of safety features and options that are available on 2019 Jeep Wrangler models. They all include a rearview camera that provides much greater visibility behind the vehicle than ever before, and LED lights not only keep the Jeep visible to others but help illuminate both in front of and behind the Jeep. This is especially important if you find yourself off road and losing daylight, as improved illumination can mean the difference between getting home safely and finding yourself in a ditch. Additional options include rear-parking sensors and blind-spot monitoring that can help a driver avoid an impact. These options warn the driver when another vehicle is in a blind spot, or when something crosses behind or comes close to the back of the vehicle while in reverse. Advanced safety options include adaptive cruise control, which can adjust for changes in overall speed, and forward-collision impact warning. While these things don't replace safe driving, they provide you with additional tools to keep you safe while behind the wheel. Even though Jeep is still teasing us about what the 2019 Jeep Wrangler has in store, we've seen enough to know it's worth getting excited for. In few places is the old motto of "If it ain't broke, don't fix it" more appropriate than when it comes to new model years of vehicles. We like to see the things that were done right carried forward, and the areas for improvement seized upon to make the new model year feel impressive. So far, Jeep has more than demonstrated that they understand that, and we can't wait to get behind the wheel when the 2019 Jeep Wrangler starts rolling out. At Faricy Boys, we’re looking to forward to the 2019 Jeep Wrangler and are sure to find the right one for you.